Tamañu d'esta previsualización: 562 × 600 pixels. Otres resoluciones: 225 × 240 pixels | 450 × 480 pixels | 720 × 768 pixels | 959 × 1024 pixels | 1874 × 2000 pixels. This photo of an opened oviduct with an ectopic pregnancy features a spectacularly well preserved 10-millimeter embryo. It is uncommon to see any embryo at all in an ectopic, and for one to be this well preserved (and undisturbed by the prosector's knife) is quite unusual. Even an embryo this tiny shows very distinct anatomic features, including tail, limb buds, heart (which actually protrudes from the chest), eye cups, cornea/lens, brain, and prominent segmentation into somites. The gestational sac is surrounded by myriad chorionic villi resembling elongated party balloons. 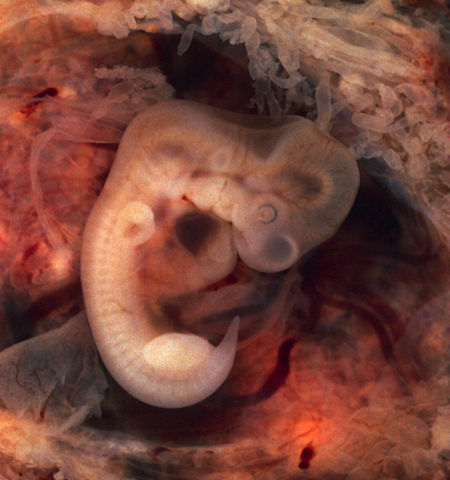 This embryo is about five weeks old (or seven weeks in the biologically misleading but eminently practical dating system used in obstetrics). The photo was taken on Kodak Elite 200 slide film, with a Minolta X-370 camera and 100mm f/4 Rokkor bellows lens at near-full extension. The formalin-fixed specimen was immersed in tap-water and pinned to a tray lined with black velvet. The exposure was 1/4 second at f/8. Fonte (2014). "Tubal pregnancy with embryo". WikiJournal of Medicine 1 (2): 7. DOI:10.15347/wjm/2014.007. L'autor d'esta obra, Euthman de Wikipedia en inglés, la lliberó como dominiu públicu. Esto s'aplica nel mundu ensembre.